The trick to understanding a solar set-up is to first identify the kind of RVing you like to do and second, understand how much power is required to maintain that lifestyle. For example, do you enjoy watching TV or running a microwave, and if so, how many batteries do you need to recharge while you are on the road? Solar is an excellent source of power, and if sized correctly, can provide a clean and quiet lifestyle and the ability to travel off the grid. What kind of RVer are you? Your battery will power lights, fans and other DC appliances. 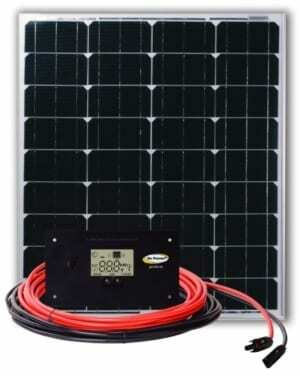 Solar will help to ensure a healthy battery charge and extends battery life up to 50%! Save the cost of shore power and battery replacements. How much solar will you need to charge your battery bank? The more solar you have the faster you can re-charge. 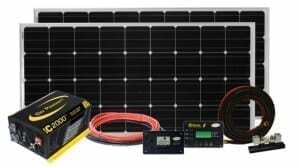 Large Solar Kits are expandable as your power needs grow and are virtually maintenance free. These complete systems integrate into your RV’s electrical panel and operation is as simple as the touch of a button. They are suitable for a 1-4 battery bank with low power draw. Solar and inverter systems allow for long-term, generator-free RVing with all the comforts of home. Don’t be stranded without power! Complete Solar (DC) and Inverter (AC) Systems integrate into your RV’s electrical panel and operation is as simple as the touch of a button. This is a reference guide only, individual power needs may differ. Consult our online calculator tool or speak with your local dealer to determine your power requirements and appropriate solar system or kit. 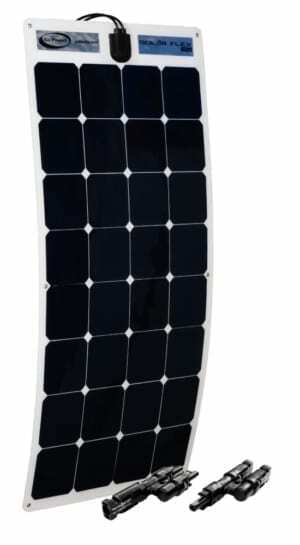 The SOLAR FLEX kit is an excellent adhesive (and screw) mount option for an RV rooftop. It’s durable and walkable surface allows for a 30 degrees bend. 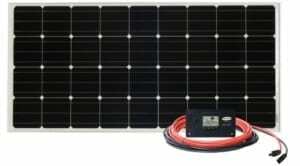 These solar kits (DC charging only) come in 200, 100 and 30 watt options. 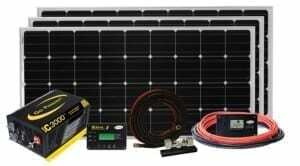 Solar Flex Expansion kits are also available. 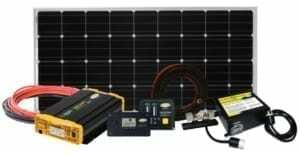 A PORTABLE SOLAR KIT is a great solar supplement to any existing solar kit/system OR as an individual, installation-free battery charger. These folding, ground-mounted kits set up in minutes! Available in 120, 80 or 40 watts.